In October 2005, the Yunnan Mountain Handicraft Center YMHC organised the first “Gathering of Friends of Diqing in Shangri-La”. On that opportunity, Diqing authorities, aware of the potentials and of the challenges ahead, requested YMHF support to set-up this workshop. The workshop took place in Shangri-La(Zhongdian), Diqing Prefecture, Yunnan Province of China, on January 16 and 17, 2006. It was jointly planned and organised by Diqing Prefecture Government / Vice Governor Shi Zongkai and by the Yunnan Mountain Heritage Foundation / Mr. Gerard Burgermeister. Diqing is one of the ten Tibetan Autonomous Prefectures in China and is rich in scenic beauty, biodiversity and minority culture. It lies at the heart of the “Three Parallel Rivers” area (Nu Jiang / Salween, Lancang / Mekong and Jinsha / upper Yangtze), a UNESCO World Heritage Site. There are over 100 mountains higher than 4000 m, with the tallest peak being the holy, spectacular and unconquered, 6740 m high Kawagebo, covered year-round with snow and glaciers. Several areas have been classified as nature reserves and the Prefecture is getting ample attention from conservation organizations such as The Nature Conservancy, Centre for Biodiversity and Indigenous Knowledge and the WWF, due to its still abundant forests and exceptional biodiversity. The prefecture has recently started to attract domestic and international tourists and hopes to follow southern neighbours Dali and Lijiang, which annually receive 2.5 millions tourists each. The region is also starting to feel the impact of China’s accelerated economic development and has plans to build significant infrastructure in the coming years, such as numerous roads, dams and mines. o Tourism has been chosen by Yunnan authorities as the main pillar of Diqing economic development. o Exceptional natural and cultural resources are the main tourism attraction in Diqing.o The Three Parallel Rivers World Heritage Site and the “Shangri-La” brand represent the best marketing values for environment- and culture-based tourism. oHow many tourists are too many? o The Chinese Government has invested more than 12 billions RMB in 5 years to develop tourism destinations and infrastructures in Diqing. 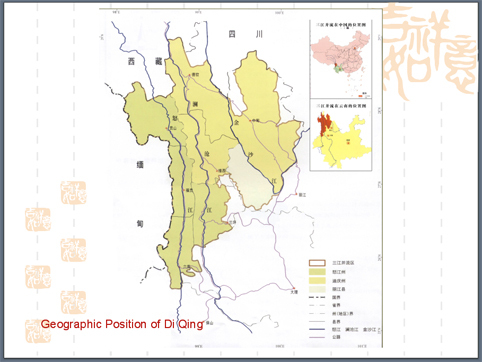 o Diqing aims at becoming a famous tourism destination in China and abroad. The goal for 2010 are 4.5 millions tourists with about 9% of them coming from abroad, with the tourism sector climbing to 70% of the Prefecture GDP. o Focus will be on the following four “products”: Sightseeing and Business Conference, Nature and Eco-travel, Ethnical Minority Culture and Scientific Research and Expeditions. o Tourism development coordination will be strengthened with Dali and Lijiang in Yunnan and with neighbouring Sichuan and Tibet. 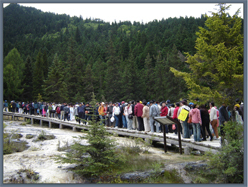 o As can be seen from Jiuzhaigou example, per-capita income resulting from nature-oriented tourism can grow faster than the national average. Some tourism experts also consider that, in beautiful north western Yunnan, income from tourism and related sectors could be much bigger than from mining and hydro-electricity. o Focus in Yunnan has been almost exclusively on the number of tourism and not enough on the kind of tourists and on the net revenue per tourist. o International experience shows that without proper controls, planning and sustainable ecologically based programs, tourism leads to degradation of flora and fauna (e.g. deforestation due to infrastructure development), pollution (sewage, waste), conflicts between local residents and tourism organizations, limited access to places and resources, disruption of traditional lifestyle and over-dependency on tourism. Without proper care, mass tourism negatively impacts the local cultures. o The recreational opportunities, their settings, their carrying capacity are all important to how people enjoy their visit, what they are prepared to pay and whether they will come back. o A National Park must be built on the following principles: scientific master plan, nature conservation, integrated management and sustainable use of resources. o Management of national parks in most countries aims to minimise any harm to people, by regulating activities, guaranteeing appropriately trained guides and safe facilities. 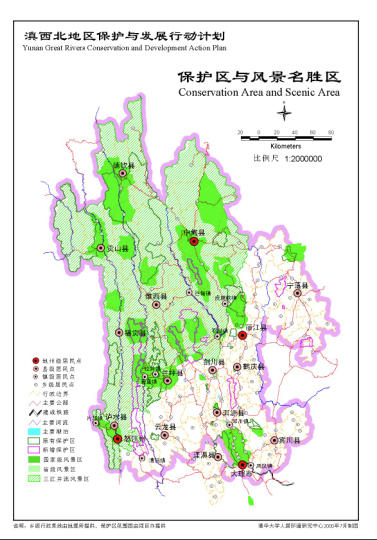 The creation of Shangri-La National Park will have many benefits, such as: improving nature conservation in the Three Parallel Rivers World Heritage Site, reducing conflicts between nature conservation and local population, boosting the qualitative development of Northwestern Yunnan and improving the status of nature conservation in Yunnan Province. Some of the concluding thoughts from the two day workshop included the following points: o Developing the Park should provide a factor for progress for local communities, improving the living condition and standard of local people. 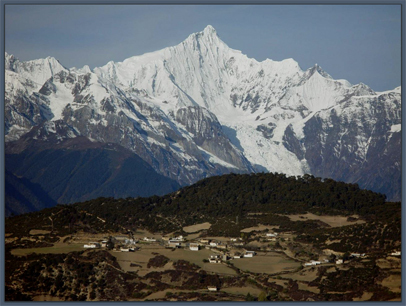 o The Preservation of Culture is an important platform for Shangri-La National Park. o The Establishment of Shangri-La National Park should be guided by the modern goals and standards on biodiversity protection, as defined by UNESCO and IUCN. o Shangri-La National Park should pursue the triple goal of becoming a model for nature protection areas, growing to a world-famous tourism area and offering environmental education and a valuable tourism experience to the public. – Protection of biodiversity and cultural heritage while planning tourism. – Involvement of the local communities (for the sake of both nature conservation and economic development and to guarantee a better experience for the tourists). – Coordination by a single focal institution. – Capacity building of all the stakeholders. – When building new tourism infrastructure there should be due consideration of local use and values (e.g. sacred sites). Environmental and social impact assessments will be of great importance. – Inside protected areas, access (path, gondola, horses, etc.) needs to be environmentally and culturally sensitive. Be careful to avoid overflow of private vehicle. – Define licensing policies and rules for specialized tour operators, like small scale ecotourism operation. Promote low volume and quality tourism. – Continuously monitor tourism development and impact. – Educate the wider public (e.g. driving habits- safety issues) by means of media. g. Move quickly on the establishment of a scientific Land-use / Zoning Plan for the entire Prefecture, defining not only the land set aside for the National Park, but also the areas with other purposes / land-use in the Prefecture, such as mining, animal husbandry, water conservancy, tourism, cultural/religious sensitive sites, town expansion, etc. Include maps with clear delimitation of land use areas and also the regulations regarding the usage of those areas. Publish the Prefecture Land Use Plan and its regulations. This is crucially important for investors. Besides, the area around a national park and leading into and out of it will impact the park itself. So this recommendation precedes discussion about a National Park and encompasses the whole Prefecture. h. Entrust a Prefecture Government Unit with the responsibility to get the Prefecture Land Use Plan done, to publicize the Plan, and to monitor ongoing compliance with the Plan. It was suggested that some of these tasks could be entrusted to the Diqing Forestry Bureau (since this institution is in charge of most undeveloped land in the Prefecture), possibly under mandate by the Prefecture Land Bureau. Overall responsibility for monitoring execution of this priority task should be at the highest level in the Prefecture Government. i. For any significant infrastructure project in the Prefecture, consider environmental, social and economic impact assessment studies as a crucial investment in knowledge, which will allows good planning, informed decision-making and reduction of costly mistakes. It is important to entrust the best researchers with these studies and then to broadly share the results with stakeholders and the public. This will offer a level playing field to all, decrease the risks of ignoring some stakeholders’ vital interests, which might create bigger problems in the future. From experience abroad, the communication and discussion of impact assessment is highly recommended. j. Move forward and officially propose the establishment of Shangri-La National Park in the areas considered for this purpose, which include mountain, grassland/lake, and gorge ecosystems. Start implementation on Bita/Shudu lakes and grassland area, as a demonstration to the local community and government as to what the National Park effort will entail. Start experiments with eco-tourism schemes. k. Create an on-going quarterly meeting to share information, monitor progress and coordinate work between all active stakeholders (business, Province and Prefecture Government, experts, conservation organisations). Participants of the workshop included among others Mr. Tong Zhiyun, Deputy Director of Yunnan Province Policy Research Center, and Diqing Prefecture delegation headed by Vice Governor Shi Zongkai. Representatives of international investors in Diqing were also among active participants. Chinese academics were well represented with senior planning and tourism scholars from Tsinghua University and Southwest Forestry University. International Environmental organisations such as WWF and The Nature Conservancy also participated, as did local eco-tourism business people. Many thanks to Gerard Burgermeister, who compiled the original report , and the team of highly qualified experts in national park planning and eco-tourism who participated in the workshop.